Top 5 Reasons To Begin Eating a Fertility Diet Today! Home → Egg Health → Top 5 Reasons To Begin Eating a Fertility Diet Today! 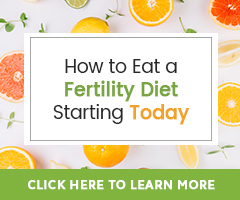 There is one thing we want anyone wishing to support their fertility health naturally or who is battling infertility to know, that the Fertility Diet is your #1 ally! This way of eating to boost fertility and overall health is at the top of our list of suggestions for men and women who want to conceive. No matter where you are at in your fertility journey, you can always use your diet to encourage and support your process. 1. The Fertility Diet includes high antioxidant foods for Egg Health and Sperm Health. Eggs and sperm are delicate cells in the body; they need protection from free radicals (unstable molecules that harm them). Egg Health and likewise sperm health are impacted by the free radicals we are all exposed to in our daily lives. If you smoke, drink too much alcohol, take prescription drugs, are exposed to chemicals on the job, or eat a lot of processed foods, you may be especially affected. A diet high in antioxidants protects the body’s cells and creates an environment where conception is more likely to occur. 2. The Fertility Diet is energizing and can revive libido. The abundance of fresh foods you’ll be eating provide the body with critical enzymes, enzymes that act as the spark plugs for literally every biochemical reaction in the body. Most people experience an energy and libido lift within a few weeks of beginning a high enzyme, Fertility Diet. High energy and a more active libido are excellent signs of increased fertility! Tip: For a super boost, consider the benefits that adding systemic enzymes can offer. 3. A Fertility Diet is anti-aging and anti-inflammatory. A strong reproductive system means a strong, vital body. The same nutrients that revitalize your fertility also have anti-aging and anti-inflammatory effects. Even if you’re not working on your fertility, a Fertility Diet can improve your life! It can especially protect against degenerative problems, offering support for healthy joints, bones, heart, immune system, and brain function. 4. A Fertility Diet is cleansing and building at the same time. High fiber in fruits and vegetables help flush toxins trapped in the body like xenoestrogens or excessive fertility drugs. Yet, unlike harsh cleansing programs, the Fertility Diet includes plenty of protein that the body needs in order to heal, for preconception and pregnancy. 5. A Fertility Diet includes essential fats for natural hormone production and balance. Your body needs essential fats from sources like seafood (or Cod Liver Oil), avocado, olive or coconut oil, and fresh nuts and seeds for normal ovulation and cervical mucus production. These foods decrease inflammatory fertility problems often associated with endometriosis, ovarian cysts, and fibroids. More good news: Essential fats also promote glowing skin, sharp vision, happy mood, and a better memory. There you have it! These are just a few of the ways following a Fertility Diet can be life changing and life-enhancing. Of course, the Fertility Diet also eliminates triggers for hormone imbalance like non-organic foods, excess caffeine, sugar and alcohol, processed soy, and GMO foods. You will truly become a different person on this diet because your actual cell makeup can change through improved eating habits.